Information about the chapter-sponsored technical communication competitions for online communication, technical art, and technical publications. 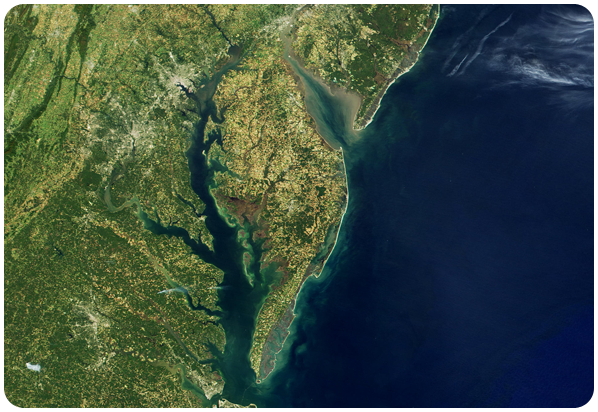 The Washington, DC – Baltimore Chapter's 2018-2019 Technical Communication Competition is OPEN! This call for entries is your invitation to participate in the competition. Enter your best work to receive valuable feedback from professionals in the field and potential awards. Information about the competition is at https://competition.stcwdc.org. Entry forms and judge applications are available for downloading from the competition website. Anyone is eligible to submit entries. You do not have to be a member of STC. You can be a student or a professional. You may enter work as an individual or on behalf of a colleague or member of your department. If you are interested in providing feedback, volunteer to judge and evaluate entries. See the Call for Judges for more information. Download the flyer to hand out to friends or post at work: 18-19 WDCB Competition flyer (.pdf). Thank you to the Judging Manager, Ann Ray, and to all the volunteer judges who reviewed and evaluated the entries to the 2017-2018 Technical Communication Competition. 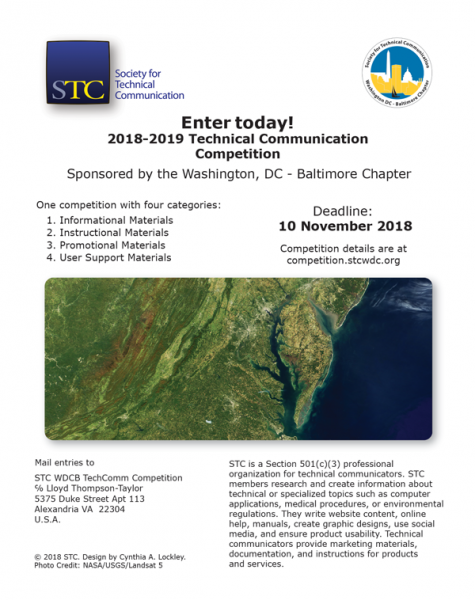 The success of the competition depends on your dedication, time, and energy in judging the Washington, DC – Baltimore Chapter's Technical Communication Competition. We are honored to have your support and the competition can not be possible without you. Competition entrants frequently tell us that they appreciate the written feedback they receive from our judges. Your experienced and thoughtful feedback is the number one reason people enter the competition and is considered more important than the award itself. Thank you for participating and making the competition a success. We hope to see your entries in future competitions. I am pleased to announce that our chapter won a new award! 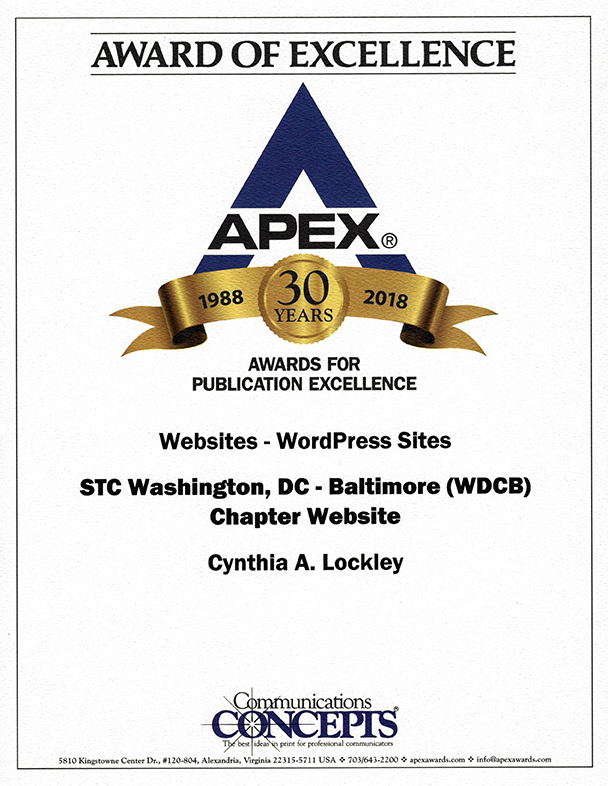 We were awarded the APEX® Awards 30th Anniversary 2018 Awards for Publication Excellence: one of five winners in the category: Websites – WordPress Sites. The Winner logo is displayed below and in the Awards section of the right sidebar on each part of our site: https://wdcb.stcwdc.org, https://competition.stcwdc.org, https://events.stcwdc.org, and https://jobs.stcwdc.org. APEX® Awards 30th Anniversary Winner logo for 2018. APEX® Awards 2018 Award of Excellence certificate. The APEX® Awards is an annual competition for publishers, editors, writers and designers who create print, Web, electronic, and social media. In APEX® 2018, awards were given in 100 communications categories, in 12 main categories including: newsletters; magazines, journals & tabloids; annual reports; print media; electronic media; social media; apps; websites; campaigns, programs & plans; writing; design & illustration; and one-of-a-kind publications. Business, nonprofit, agency and freelance communicators can enter APEX® to win awards for their best writing, publications, campaigns, programs, design and media. Entries are submitted from all over the world such as the U.S., Canada, Singapore, the UK, India, the Netherlands, Germany, Hong Kong, South Africa, and more. Communications Concepts, Inc. sponsors the APEX® Awards, and advises professionals who write, edit, and manage business communications, on best strategies and practices. How many entries were there? How many awards were given? APEX® 2018 awards were based on excellence in graphic design, editorial content and the success of the entry — in the opinion of the judges — in achieving overall communications effectiveness and excellence. 1,408 entries were evaluated, in the following distribution: Newsletters: 102; Magazines, Journals & Tabloids: 287; Annual Reports: 41; Print Media: 97; Electronic Media: 111; Social Media: 54; Apps: 11; Websites: 80; Campaigns, Programs & Plans: 109; Writing: 284; Design & Illustration: 163; One-of-a-Kind Publications: 69. A total of 100 APEX® Grand Awards were presented in 12 major categories to honor the outstanding works in those categories. 556 APEX® Awards of Excellence recognize excellence in 100 individual categories. Is there a list of winning entries? Yes. See Announcing the Winners of APEX 2018 (pdf). Follow the APEX® Judges blog at https://apexawards.wordpress.com for APEX® judges comments, as well as writing, editing, publishing, and media topics. APEX® 2019 will open in November 2018. The entry deadline for APEX® 2019 is February 15, 2019. Some categories may change.